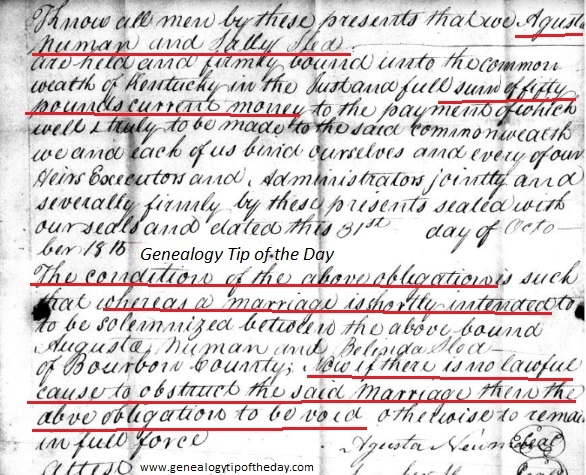 In October of 1815 Augusta Newman and Sally Sled signed a marriage bond before the marriage of Augusta Newman and Belinda Sled could take place. Not has already been made. Otherwise to remain in full force. That “otherwise” was if there was lawful cause to obstruct the marriage. The amount of the bond “was to be paid” if the agreement was in full force. The agreement was to remain in full force if there was a lawful reason to obstruct the marriage. The amount of the bond was not a fee to be paid upfront. The amount of the bond was to be paid if it turned out there was a legal impediment to the marriage. Augusta Newman and Melinda Sled did not walk into the courthouse with fifty pounds of “current money” in order to get the marriage license. Check out Michael’s newsletter–Casefile Clues. There have been a couple of times that I wondered how long that agreement held. What if they did get married and found out later one was already married? Or some other reason. Thank you for this information. I have been trying to figure out how some of my very poor ancestors ever came up with the money to get married. Now I see that they didn’t have to pay that fee. This makes so much sense. Exactly. As we mentioned, it was a potential fee. If the marriage was on the “up and up,” the bond was not enforced.